This article aims to aid the selection of an SEM which suits your requirements. Perhaps you need more SEM capability, or you have a floor model SEM but require a new one which is faster and less complex, or you outsource your SEM. Selecting the correct SEM could increase productivity, due to the increased ease, speed and accessibility of desktop SEMs. When selecting either a desktop SEM or a bigger, floor model system, the main factor within your decision is often a matter of cost: desktops are much less expensive. However, there are numerous other qualities which make desktop SEM superior. Initially, lets discuss cost. Desktop systems are typically much cheaper than floor models. This cost is justified as the resolution which can be obtained with floor models is far better than desktop systems. That being said, desktop SEM’s now can obtain resolutions which are lower than 10nm, which is adequate for over 80% of applications. Floor model systems also require additional expenditure which must also be considered. Many facilities are required: usually a specific room (perhaps with specialized foundations and environmental isolation) and supplementary areas and materials required for the preparations of samples. Additional costs also include operator costings, requiring a dedicated operator, who is trained in the operation of machinery and preparation of samples. This operator cost will be a persisting cost throughout the lifetime of the machinery. Desktop SEMs, alternatively, are less costly to purchase and do not need a dedicated area or operator. This therefore makes it far more superior in terms of costings. Desktop SEM machinery is much more efficient, as it does not require extensive sample preparation and the relaxed vacuum requirements and small evacuated volume enables much faster image production. Additionally, desktop SEMs are normally carried out by the individual who requires the information, which thereby eliminates time required for a specific SEM operator to carry out analysis and produce a report. Moreover, as well as obtaining faster answers, it is also beneficial to be able to carry out analysis straight away and for the user to be able to manage it in real-time response to observations. Furthermore, when carrying out inspection, for example, extensive delays lead to a large cost by placing additional work which is currently being carried out at risk. If the application is routine and well defined then a desktop SEM can produce the necessary materials at a lower cost. Consideration of future requirements, which may require resolutions outside of a desktop SEM’s capability, should be considered, however, out-sourcing is a potential option. However, if future requirements will exceed the capability of desktop SEM, it can be utilized to aid a future floor model system, giving you a return on investment. For example, it can be used to screen capacity and to carry out routine analyses, leaving the floor model system available for more challenging uses. Another use of a desktop system is within the justification of a larger floor-based system, confirming the advantage of carrying out an SEM, evaluating the requirements of an external provider. Another consideration to bear in mind is the number of individuals who will be utilizing the system, how much training they have and the amount of time taken to train. 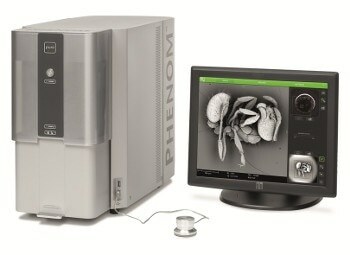 Whereas floor-based systems require lots of training, desktop SEMs are very simply and have minimal sample preparation. They obtain results after pressing a few buttons. Progressive methods can be accessed by individuals who have specific needs, if they have time to be trained. However, the majority of applications require much less training in comparison to the floor-based systems. This system is also much more sturdy, exceedingly hard to break and cheap to repair. When selecting a SEM, the following should be considered: Pricing, Speed, Applications, and Users. Overall the question is: does a desktop SEM meet the requirements of application? In most situations, the answer will be yes, if the resolution limits of 10nm are enough. This is enough for 80-90% of all applications and therefore, you can spend much less and get a machine which will carry out the same procedure.